Starting tomorrow, Thursday, May 24, work has progressed to begin the west bound Sheyenne Street bridge demolition and crews will move traffic to the same side of Interstate 94 (I-94). Eastbound and westbound I-94 motorists will be carried head-to-head in one lane of traffic in each direction for about 1 mile surrounding the Sheyenne Street interchange. 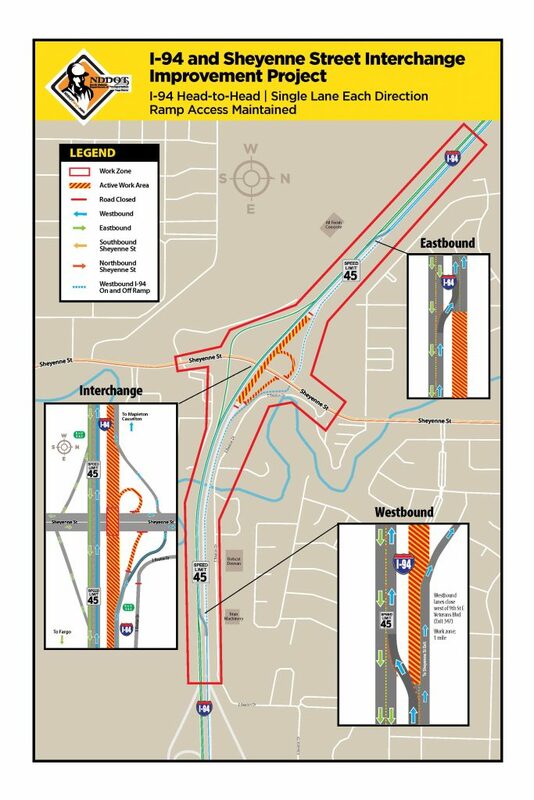 Tomorrow when westbound traffic shifts to the east side, the northwest Sheyenne Street exit loop ramp will close for use. Crews will begin reconstructing the ramp to work with the new modified single point urban interchange design. Interstate traffic will remain in this driving pattern until the first year of work enters into winter suspension in late fall. Speeds on I-94 will be reduced to 45 mph on the interstate and 25 mph on the interstate ramps. Since the project work starting last week, crews have been active around Sheyenne Street ditch areas beginning the storm sewer improvements and under the bridge preparing the area to go head-to-head. One of the easiest choices motorists can make as a driver when you enter a work zone is to slow down. Motorists are encouraged to eliminate distractions and pay attention to traffic changes throughout this dynamic work zone.